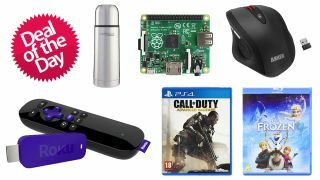 TechRadar Deals: Roku Streaming Stick, cheap Blu-ray movies + Call of Duty! TechRadar Deals are put together each day to save you money, and today we've found some excellent deals you might find irresistible. Why don't we kick off with a couple of superb deals on Blu-ray movies? Firstly we've spotted the Frozen Blu-ray disc on Amazon for just £10 - if your young kids don't have this it's surely a must-buy. And if you're a Tolkien fan we've uncovered a bargain just for you - The Hobbit: The Desolation of Smaug for just £5! The standard price for this one is £10 so be sure to add the secret discount code when checking out - that code is SPEND10. Want a cheap and easy way to get superb smart features on an HD TV that doesn't have Netflix and BBC iPlayer already built in? The excellent Roku Streaming Stick is a little dongle that plugs directly into your TV's HDMI port and adds hundreds of smart apps for your viewing pleasure. And you can get it on Amazon right now for just £39! Heads up PS4 gamers. If you're keen to play the new Call of Duty, Advanced Warfare can currently be had for just £34.85 over on Simply Games and that includes free delivery. If your laptop's trackpad is driving you mad, you really ought to bite the bullet and buy a wireless mouse. It makes using a laptop so much easier if you've got the space and this full size ergonomic mouse is currently on Amazon for just £10. No brainer! If you're planning on picking up a new TV, games consoles or any other gadgets before Christmas, you might also need a new power extension? The Duronic ST10B 10-socket 2-metre extension is now just £6.99 on Amazon. And finally, with winter setting in one of the best ways to keep warm on the way to work is to take a brew with you. This 350ml Thermos is just £3 on Amazon right now! Don't be the one to arrive in the office with blue fingers!